Now we will walk you to using each graphical guide. 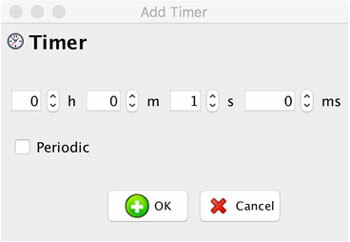 To create a timer, click on a Timer Icon in the toolbar. Select an time period and tick repeat if you want to trigger the timer periodically. Once you press OK, myDESIGNER will automatically create a code for you and insert it into the edited script. 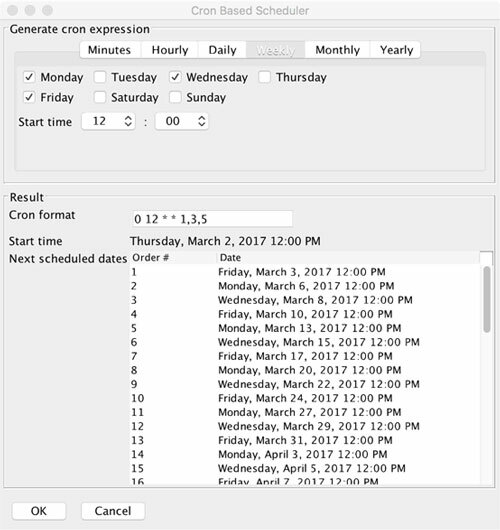 Now select the dates and times, when you want your code to be run and press OK button. myDESIGNER will automatically create a code for you and insert it into the edited script. You can make periodic export of data-log data into CSV file. This file is easily readable by Microsoft Power BI. To do so, please click on the button Export. For detail description, please see section Simple Periodic Export to CSV and Microsoft Power BI in this manual. Loop over results: if this option is checked, you will have an option to loop over the retrieved records and process them in your script. Export to CSV (Server side scripts only): if you choose this option, the retrieved historical data will be exported into a CSV format and saved into a file. File is saved under a provided name into user data folder accessible over FTP or HTTP and HTTPS. press OK button. myDESIGNER will automatically create a code for you and insert it into the edited script. 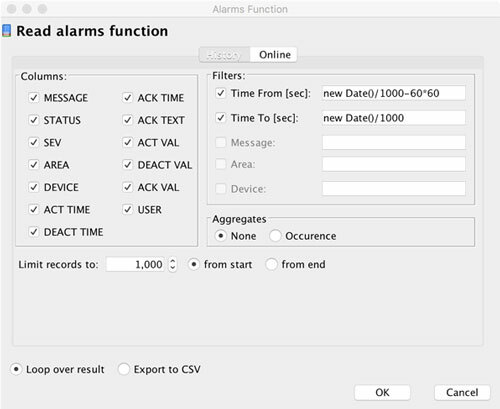 Historical alarms dialog has several sections. We will explain in details each section. Columns allows you to select all the data retrievable from the history. Please select what columns you want to process. 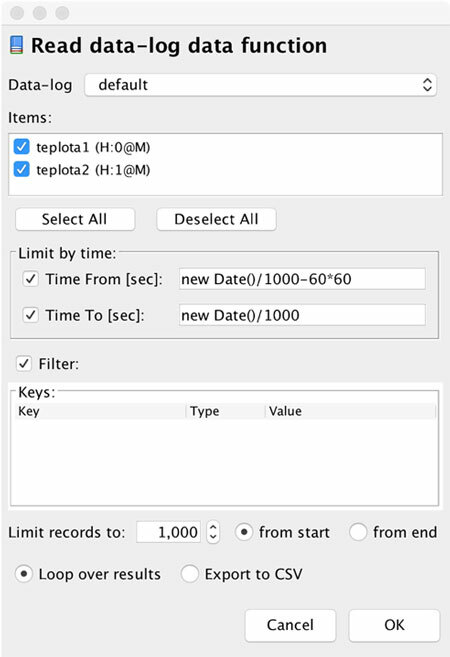 Currently, you can filter retrieved data based on time interval. Future versions will allow to extend the filter for Message, Area and Device as well. If you need historical alarms in the form they have been stored, leave aggregates to none. 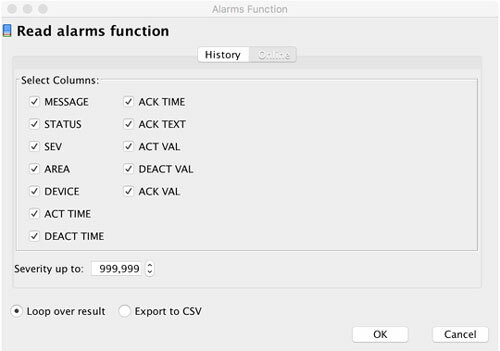 If you want to retrieve an aggregated data based on alarm occurrence count and overall activation time, please tick the occurrence option.